Two New Innovative Products for Your Coop! 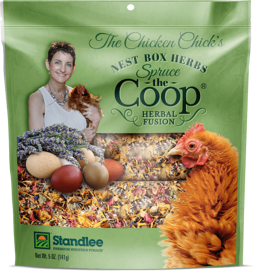 Standlee Premium Western Forage® has partnered up with The Chicken Chick® to bring you two new innovative products for your coop! These two products were designed with your coop in mind. Keep your chickens happy and their coop smelling fresh and dry with added aromatic benefits for a much needed mood boost for you and your animals! Every chicken coop and home should smell this heavenly! The aromatic benefits from volatile oils in herbs are proven to affect the mood and stress levels of both people and animals! Spread this around your coop or in your home for a delightful scent that everyone can enjoy! Available in 5-ounce and 16-ounce packages at Tractor Supply Company and other retail locations. The Chicken Chick’s Sweet Coop® is an all-natural zeolite for chicken coops – Because a wet coop stinks! 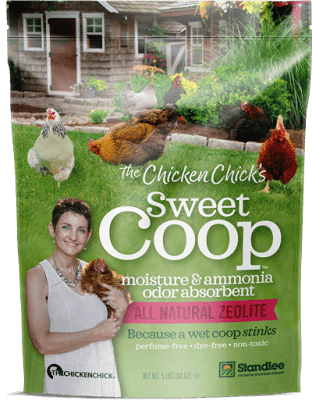 Sweet Coop® naturally controls moisture and harmful ammonia gas odor in the coop for a sweeter, healthier home for your chickens! Available in 5-ounce packages at Tractor Supply Company and other retail locations.